I did a workout years ago with a friend as we prepped for the Portland Marathon. He was supposed to be pacing me on a marathon paced run. Unfortunately, he's loads faster than I am (he ran a a sub-3:00 marathon to my 3:28) and the pace gradually drifted up to the point where I couldn't breathe. Not that I entered oxygen debt. I mean it more in the literal sense - I have exercise-induced asthma, the temperatures were in the low 30's, and the pace all combined to trigger an attack. Since I have my own little issues with breathing, I think it's important to pass on the knowledge to the junior high school kids I coach. Not the asthma part, the breathing part. Every year, I lead them through some exercises on breathing. Depending on how long the kids have been with me, we'll experiment with different things. This year, I had two runners that had been with us since the sixth grade and the rest were new to the sport. So I co-opted Thing 1 and Thing 2 to help the younger kids. First, at very low speeds we sent them around the Chief Looking Glass park with instructions to count how many steps they took per breath. A breath was a full cycle of inhalation and exhalation. Then we sent them out to do it again, because combining activities for junior high kids leads to mass confusion - most of them lost count. And their form fell apart because they're not to the point where they can do two things at once - run and count - without one of them getting a little sideways. At idling speed, Thing 1 (Carmen) was taking six strides per breath and Thing 2 (Maia) was taking eight. This was consistent with their training levels - Maia has been training hard for two years while Carmen is just starting to transition from running with sisters to training for races. The younger runners reported an average of four strides per cycle with a couple at six. We repeated the drill at several different speeds so they could get a feel for how their breathing changes at given paces. For a lot of them, it was an eye-opener. Natalie, one of the sixth-graders who also does martial arts, adapted the fastest. 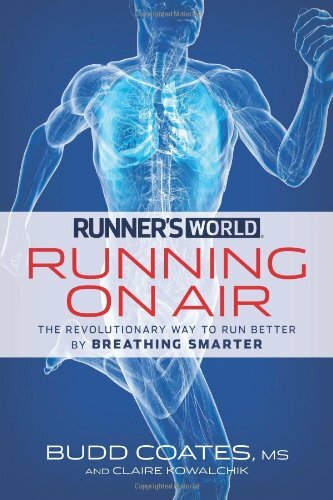 This comes to mind because I came across a book, Running on Air, that proposes to teach a runner how to breathe to maximize speed and endurance. Obviously, I've ordered it and it's on the way. I'll do a review once I read it. The part that caught my attention was a proposition that the way we breathe and run is incorrect. Specifically, the use of even numbers which means that we always begin a breathing cycle on the same foot. Since belly-breathing loosens the core during an inhalation, this creates an imbalance that taxes the leg/side that begins the breathing cycle. Interesting idea, hence the ordering of the book. The other claim that was interesting was that the average runner uses about 60 percent of their lung capacity. Since breathing is always my limiting factor, it's an area where I have the greatest potential for improvement. I suspect that this is true of the kids I coach. The downside is that I don't think I can fully teach the ideas to the kids in the short junior high season. I can, however, introduce it to them and start the process.